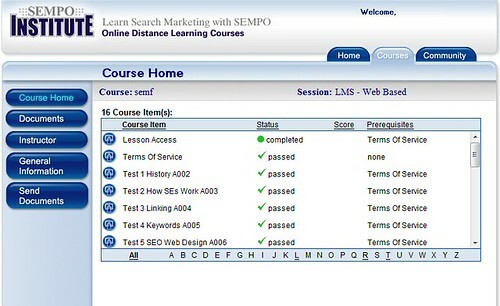 Late in 2007 the SEMPO Institute released several search marketing-focused online training courses. 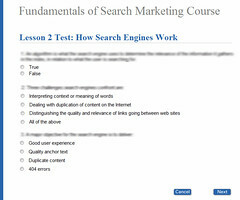 The first course, Fundamentals of Search Marketing, offers 14 different lessons encompassing the basics of SEM and SEO. To get a sense of what was offered, our CEO Lee Odden asked my coworker Jeff Nolan and I to take the Fundamentals course and write up a blog post. The SEMPO Institute Fundamentals SEM course is designed for people who are new to the search industry and those who have been in traditional marketing and are now opening up to search marketing as a new career. Composed of 14 lessons that range from â€œHow Search Engines Workâ€ to â€œSEO Web Designâ€, the lessons provide useful tips and real-time examples as well as supporting tools such as those used for keyword research or pay per click. Each lesson provides study materials and an online course packet. The course materials present basic concepts, ideas and examples that are used daily by search engine marketing professionals. Throughout the lessons, the reading is broken up by short mini-quizzes that keep you on your toes and reinforce what youâ€™ve been reading. At the end of each lesson a 20 question test is given on the course material just read. Questions on the tests are composed of true or false, multiple choice, matching and fill in the blank. A score of 75% or above is necessary in order to pass, but tests can be retaken as many times as necessary in order to receive the passing score. The Certificate of Completion is not issued until all lessons are passed. Because this course covered a variety of topics, the test questions ranged from simple to difficult, testing how well the section is read and making sure the reader pays attention. There was a lot of in depth information provided on how to set up a successful PPC campaign, and the amount of test questions on this topic and the difficulty of those questions reflected what was learned. In the SEO Web Design section, tags such as <nofollow> and <noarchive> were described, as well as the appropriate situations in which to use these tags. Also covered in the fundamentals course is directory submissions and how they can benefit any website, basics of good copy writing and the tracking and reporting of an SEM campaign. One of the last sections in the course was called â€œCurrent Innovationsâ€ where the rise and implementation of universal and personalized search were covered. The course rounds out with an informative section on intellectual rights and which written information available on the web belongs to whom. For anyone interested in beginning a search marketing career or for those who need to brush up on their basic knowledge of search marketing, this course is a good foundation. Even for those working in an offline marketing field, this course will help bridge the gap between traditional advertising and search marketing. If you already have experience working in the search marketing industry, the SEMPO Institute also offers an Advanced SEO Specialist course for more in depth training on SEM and SEO, as well as an Advanced Search Advertising course, focusing on developing and maintaining successful PPC campaigns. Excellent review! The fundamentals are absolutely critical to know not just for search marketing but marketing in general. If one can learn the fundamentals effectively then they will have a great basis to start generating results.